Creating the pin-up hairstyle with a short hair can become a easy process if you try to follow a proper procedure. This hairstyle must be started a day before and left throughout the night before getting the shape properly in the next morning or you can also do the same on the same day. Here is a technique that can help in achieving this look. Try to maintain the volume in your hair before creating this hairstyle or you have to create the volume during the styling process. Before starting the hairstyling make sure that your hair doesn’t look spiky. Then wash the hair before using a hair conditioning product and mist the hair with a spray. 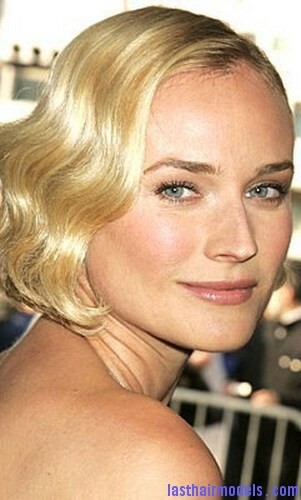 Then use a flat iron to create short waves in your hair to get a tousled look. Try to create waves in your hair throughout the head before proceeding further. Next take small section of hair and start rolling this section from its end towards your scalp. Now take the barrel curling iron to take the hair away from your face which can help to add more volume into the hair. Use bobby pins to keep this section of hair in place and try to leave some of the curls in your hair down. Now take another section of hair in the same way and secure it in place with the help of bobby pins after using the barrel curling iron over this hair part.